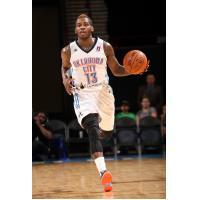 OKLAHOMA CITY, April 3, 2015 - Oklahoma City Blue guard Dwight Buycks signed a 10-day contract with the Los Angeles Lakers on Friday. Buycks is the 23rd GATORADE Call-Up in the Blue franchise's history and second of the 2014-15 season. In 10 games (all starts) with the Blue this season, Buycks averaged 18.2 points, 6.8 rebounds, 6.2 assists and 2.1 steals in 34.5 minutes. The Marquette product scored over 20 points on three occasions and registered three double-doubles. Buycks joined the Blue on March 4 after spending the 2014-15 season with the Tianjin Ronggang Gold Lions of the Chinese Basketball Association, averaging 26.1 points, 5.3 rebounds, 5.0 assists, 2.1 steals and 36.0 minutes in 18 games (17 starts).